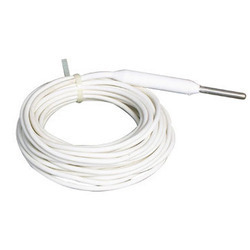 Autoclave RTD sensors are designed to withstand the high pressure and temperature environment of the continuous sterilization process in autoclaves. 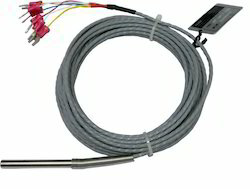 This sensor measures temperatures up to 150°C.Silicon Rubber insulated Cable in 10 meters and 5 meters. Its 3-wire Pt100 RTD element can be constructed in single or dual assembly in Class A / Class B as per the IEC 751 standard for RTD sensors. 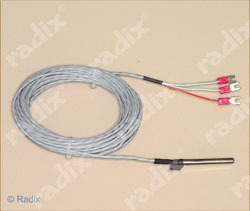 For RTD sensors to be used for autoclave validation, refer MODEL–RT043. We are leading Manufacturer of RTD Sensor - Autoclave Validation and our product is made up of good quality. Autoclave Validation RTD sensors are designed to withstand the high pressure and temperature environment of the sterilization process in autoclaves under validation. This sensor measures temperatures up to 150°C. Its teflon insulated cable with strain relief sleeve ensures a leak proof joint and the RTD sensor can be completely submerged in water. RTD for dry heat sterilizers (DHS) are designed to withstand high pressure and temperature environments which are encountered during sterilization process. This sensor is capable of measuring temperature up to 250°C. Its teflon insulated cable are rated for upto 250°C & are terminated into fork type lugs as standard. Other cable terminations are available on request. Cable length : 10 metres, 5 metres , 3 metres, thereof in multiple of 1 meter. Pt100, 3 wire, Single in Class A / Class B accuracy as per IEC 752. Looking for RTD for Autoclaves ?